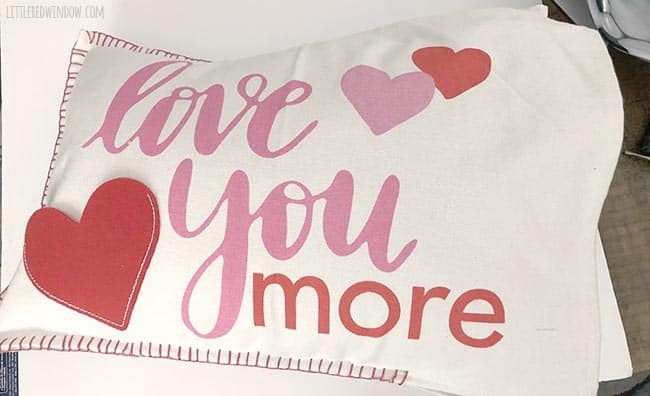 Make this adorable & easy placemat pillow for Valentine’s Day, no need for a sewing machine, you won’t believe how simple it is! 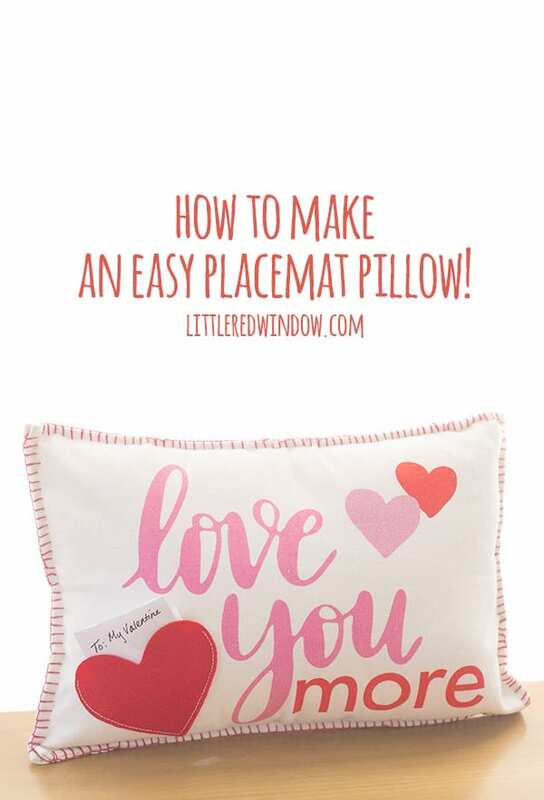 You guys, if you came here looking to learn how to make an easy placemat pillow, you’ve come to the right place. 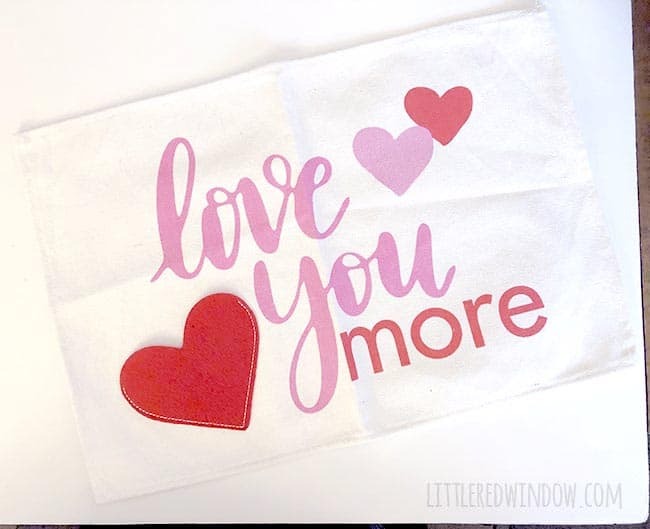 I grabbed the cutest little Valentine’s Day placemats in the dollar section at Target (but don’t worry, I linked to some alternate options below) and decided to turn them into the CUTEST placemat pillow ever. I especially love that this one came with a little heart pocket! I stuck a tiny Valentine’s note in there for O to find. The great thing about a placemat pillow is that all the decorating work is done for you. Find a cute print and bam, 80% of the project is done! No stencils, no vinyl, no painting…. I know, I really am a genius. You can tell me. I think I’m going to put this one on our couch for the month of February, I suspect the kids will get a kick out of being able to leave little notes in the pocket. But hey, if your placemat doesn’t already have a pocket, that would be SUPER easy to cute out of felt and sew on. Probably would only add another five minutes to this quick and easy project! Put your two placemats together wrong sides together. You may want to pin them as you get started. 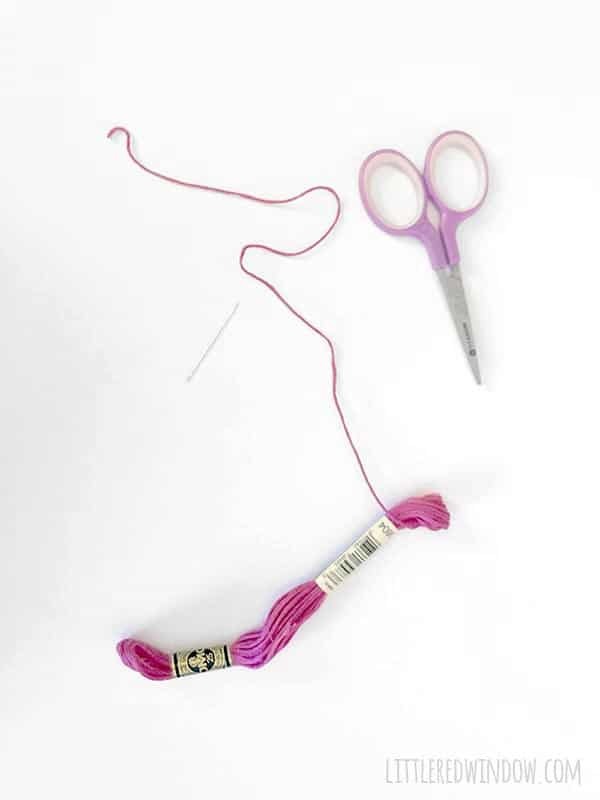 Thread your needle with a length of embroidery thread and begin to stitch the placemats .together around the edge with a blanket stitch. 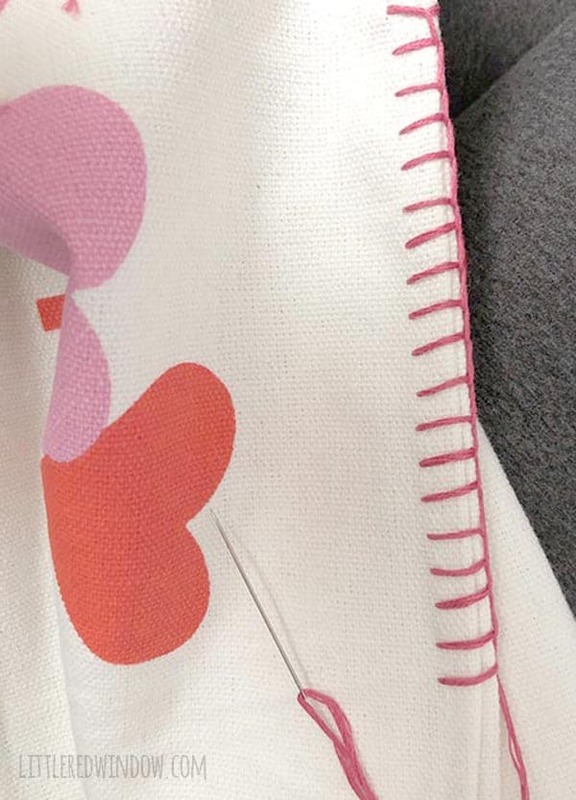 Wondering how to do a blanket stitch? Continue on around the pillow until you have stitched together one short side and halfway up two of the longer sides. Stuff your pillow form into the placemat pillowcase. Continue stitching up the rest of the way around the edges of the placemats to finish the pillow! And that’s it! 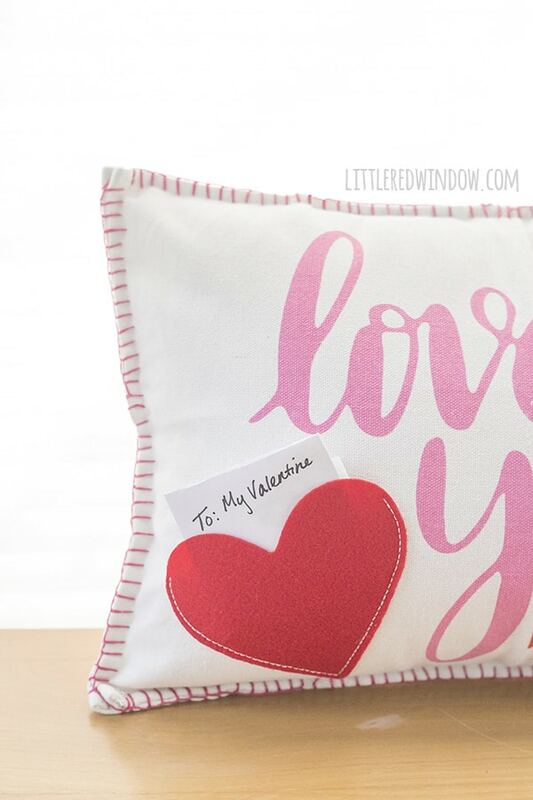 Enjoy your adorable and easy placemat pillow! 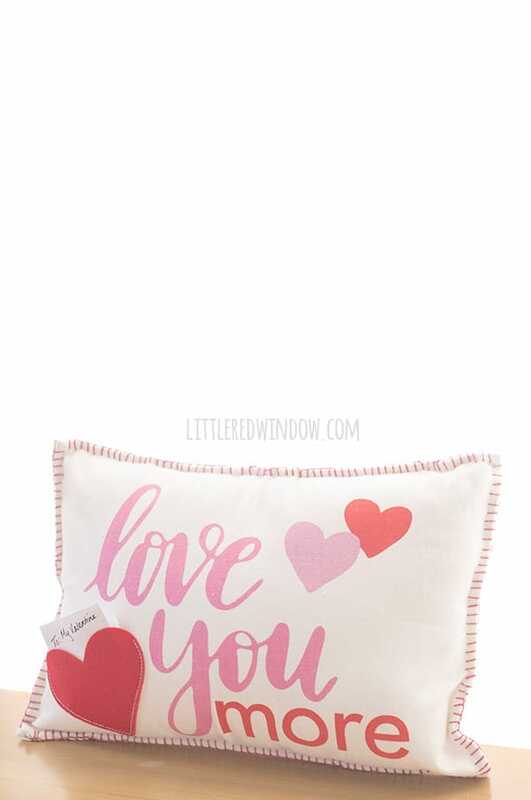 Love your idea for easy pillow going to make one also will think about trying one for Easter too. Thanks for all your great thoughts and ideas.